Bus from Johor Bahru to Teluk Intan is one of the most important to connect residents between the two cities. Bus is the most preferable mode of transport to travel from Johor Bahru to Teluk Intan because there is no direct flight and train service available for this route service. 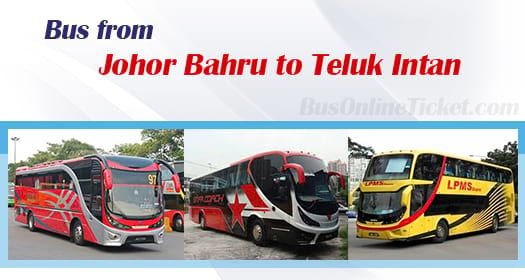 Maju Express, Star Coach Express and LPMS are few bus operators operating bus from Johor Bahru to Teluk Intan. Their combined trips have 6 daily departures with 3 departures in the morning and 3 departures in the evening around 9:30pm. Please note that there is no bus service from Johor Bahru to Teluk Intan in the afternoon session. Duration required for the bus from Johor Bahru to Teluk Intan usually takes about 7 to 7.5 hours depending on the traffic and weather condition. At least one stopover will be provided during the journey. Additional washroom break will be given upon request from the driver during the journey. The bus fare from Johor Bahru to Teluk Intan is priced affordably on the range from RM 52.70 to RM 70.00 depending on the choice of bus operator. Maju Express is the only operator offering child price for bus from Johor Bahru to Teluk Intan at RM 39.50. Bus driver will pick up the passengers based on their selection of the boarding point. There are two boarding points that are available for selection, which are Larkin Bus Terminal and Tun Aminah Bus Terminal. When arriving at Teluk Intan, the bus service will terminate at Teluk Intan Bus Terminal. Passengers are recommended to book bus ticket from Johor Bahru to Teluk Intan online in advance especially during holiday and peak season. The best way to purchase bus ticket online is to go to BusOnlineTicket.com which is the most reliable one stop ticketing portal. BusOnlineTicket.com accept many payment methods such as credit cards, Paypal, internet banking, Alipay and many more.